In an earlier article we were talking about embroidered fleece work jackets & the wide range of options that we can supply. These can all be embroidered with your company logo. Now that’s all well and good, but how do you know what you’re getting for your money? I thought we’d better look a bit further at what we’d recommend for different situations. Outdoor Work Fleeces – The Choice is as Wide as Cumbria is Long! 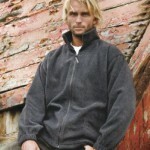 In the most popular, full zip option, of fleeces suitable to use as workwear for staff uniforms, we have a wide range. 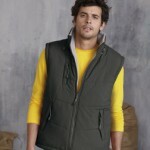 We get them from all the big brands like: Regatta, Result, Fruit of the Loom, Russell Collection & Kustom Kit. It comes in a good range of colour options & there’s a ladies version as well. It does just what you’d expect and because Regatta is a brand everyone knows, it’s popular! As with most of the Regatta range it’s designed to be used as a lining for their range of shell jackets, as a “plug-and-wear” zip in liner, which creates a lot of flexibility. But would it be my first choice, if I wanted a fleece that was offering protection from the cold & great value for money? What, if anything, is there out of such a wide range that gives you a little bit more? For the same price you can have the Result Polartherm fleece option. The big difference is you get it in a 330gsm fabric. That’s 17% extra thickness in the fabric for the same money, which has to be a winner when you’re buying a garment to keep you warm? There is a possible downside though. The Polartherm has open front pockets rather than a zipped version which some people do find to be a drawback. Personally it doesn’t affect me, I want to be warm & my hands are in the pockets rather than worrying about having my keys drop out of them! With a wide range of colours this fleece is my recommendation on value for money mixed with product specification. Check it out on the fleece tab of the catalogue! Looking for even more warmth? Regatta have 2 more great options. The Sigma fleece is a 380gsm fabric garment with a similar specification to the Thor range, however it only comes in 3 colours which can be slightly limiting. There’s also the Asgard fleece which we’ll discuss further later. 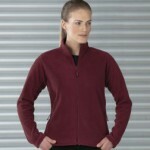 Russell Collection lady fit work fleece for female staff who want warmth as well as style. If you’re looking for a lady fit fleece then our suggested alternative to the Thor would have to be Russell Collections outdoor version. There’s not much to choose between them specification wise, The Russell being a 320gsm fabric is the main point. Even the colour ranges are similar, but it’s our belief that it is a nicer looking garment, for the same price in a better weight of fabric. If you’re someone who prefers a zip neck option to the full zip fleece then the option becomes even more weighted to the Result fleece over the Regatta. In this area you’re choosing a 330gsm fabric over a 250gsm one, that’s over 30% more warmth giving fabric for your money! Again there’s plenty of alternatives from Fruit of the Loom, Russell Collection & Kustom Kit in various colour schemes. As a choice for businesses to use as part of their staff uniform or workwear outfit, they are a great base for turning out embroidered fleeces with your branding. Depending on the environment you’re in any of the garments already discussed make perfectly adequate workwear fleeces for most uses, However there’s a couple of alternatives that are well worth looking a little further at. As mentioned earlier Regatta have the Asgard which is perfect as an outdoor work fleece where temperature can be a real issue. It’s a lined fleece, quilted with a polyamide lining of “Thermo-Guard” insulation and fitted with a high zip through collar to keep you warm regardless of what the temperature gauge is throwing at you. The only draw back is the fact that it only comes in 2 colours. 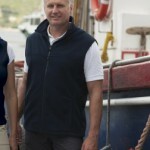 Another one for the workwear fleece market comes from RTY Workwear. The RT50 has some nice features where durability might become an issue. 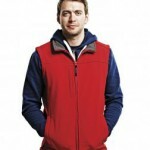 It comes in a 300gsm fabric with all the expected features for work fleeces. As useful extras, you also get a pen pocket to the left sleeve and patches to the elbows as a real durability boost! There are also eyelets at the underarm for a little ventilation when you’re working hard. We have a great range of micro fleece and in reality, there’s not a lot to choose between any of them. But for a recommendation we’d go with the Henbury H850 & H851 versions. There’s a fantastic range of colours available which makes it possible to combine these into any workwear package. The unisex version features an extended tail, covering the lower back better than is usual, which is a real plus if you’re taller than average! What we really like about these as work fleeces, in general, is the way that you get similar fabric weights in a far lighter feel. The density & structure of the pile on the fabric is fantastic & given the choice between a standard outdoor fleece & a micro fleece I’d take the latter every time. They also have the great advantage, that if you’re cold, then using these styles of work fleece for layering up under a jacket for those cold, wet, miserable winter days, feels relatively unfettered. To discuss any details on our fleece range to you can either give us a call or contact us via our website. This entry was posted in Fleece, Workwear and tagged borders, Cumbria, embroidered, fleece, North West, workwear on 6th December 2014 by admin. Work Fleece: Never Underestimate The Knowledge of Sheep! Lets talk work fleece! It’s that time of year again, some say it’s Autumn, some already insist it’s winter. There’s frost in the air, snow on the hills and our little planet is racing through entirely the wrong part of space ….. Be honest, it’s cold working out in that Cumbrian chill! Nature has given our friends in the animal kingdom fur coats, or in the case of the humble sheep, a fleece! Ever resourceful that’s what we, the human race, have used as the inspiration for the mighty work fleece! OK there was a bit of input from the outdoor industry too but the basic idea of a fabric that stays warm and insulating no matter what the weather threw at you came from our four legged friends! Regatta Thor III. 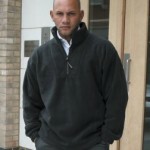 A perfect garment to embroider as a work fleece to make your staff uniforms warm and smart looking. Zips into Regatta’s RG007, RG008, RG010 jackets as an inner. Zips into RG007, RG008 RG010 jackets as an inner. Regatta Asgard lined fleece for work or play. For some added cold protection try the RG125 Regatta Asgard II Quilted Fleece Jacket. A lined fleece that delivers amazing warmth! As well as full zip there are half zip options. Also available are micro-fleece, contrast colourways & fleece bodywarmers; We have over a hundred different styles all of which can be embroidered with your required details & logos. 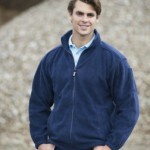 Be stylish & warm in a fleece from Stitch & Print – You can check out further information here. This entry was posted in Fleece, Workwear and tagged Cumbria, embroidered, fleece, North West, workwear on 22nd November 2013 by admin.